Congratulations to the 2019 Merit-Based Scholarship Winners! The GSA sponsors a Merit-Based Scholarship Opportunity for Graduate Students! Applicants must be a full-time or part-time, matriculated graduate student with a minimum GPA of 3.5 at SUNY Buffalo State (Students in their first semester are NOT eligible to apply for the scholarship). An essay of no more than 1000 words explaining why you deserve to be considered for the scholarship AND how the scholarship will contribute to your academic development. Two (2) letters of recommendation testifying to your ACADEMIC accomplishments and ACADEMIC potential for graduate success at SUNY Buffalo State. 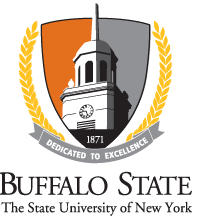 Letters must be authored by members of faculty, administration, or staff at SUNY Buffalo State. All materials must be submitted online by February 8, 2019. Students may only receive the scholarship once during their course of study. Money is paid directly to the student.